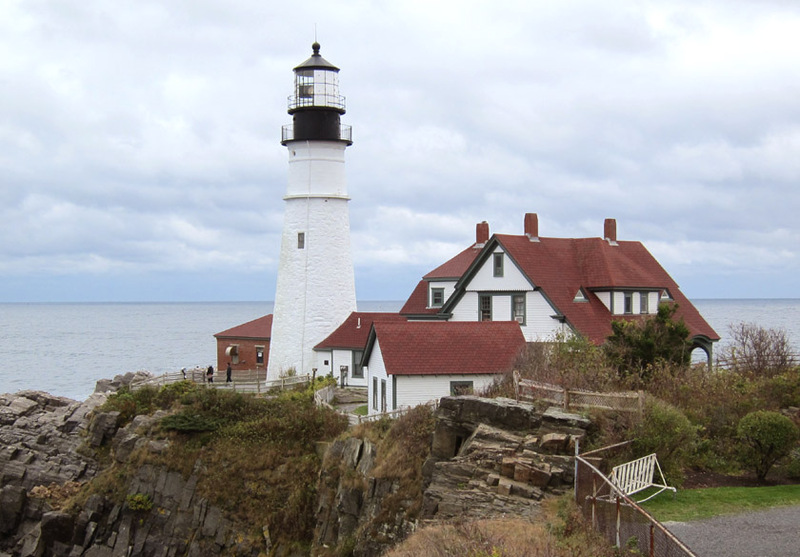 The Cape Elizabeth lighthouse is featured in two paintings. The keepers house and tower have largely been preserved since Hopper’s visit. In the MFA image below, the coastline has either eroded dramatically in the last ~90 years or was filled in by the artist so that the yellow-green grass in the foreground would balance with the blue of the sea. I tend to think that the rock was eroded in 1927 as you can see some plants and then the cliff face just to the left of the fence. I stood at the edge of the land to get the modern photograph which mostly seems to fit with the perspective of the house. Even if I’d stepped a few more feet inland (right), the cliff would have been visible and if I moved further back, then I was begin moving up a fortification embankment. It seems likely the landscape was altered in the image to highlight the lighthouse and associated buildings. 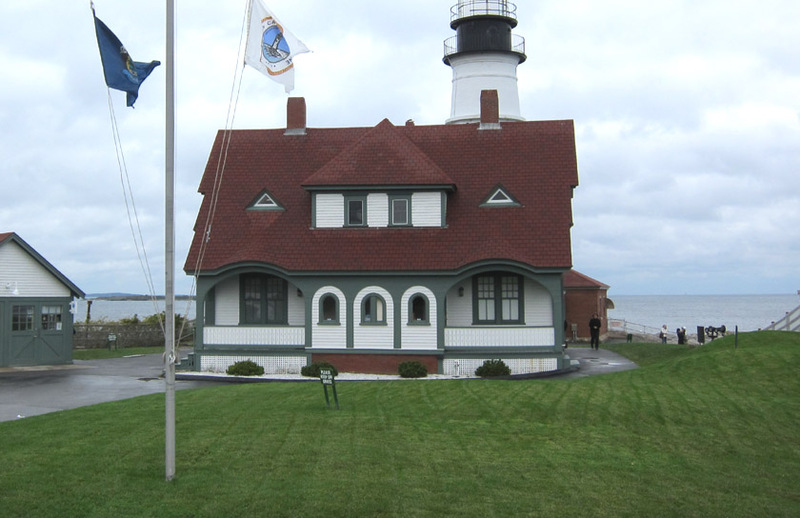 The Wadsworth Atheneum in Hartford, Connecticut owns a strangely cropped image of the Cape Elizabeth Keeper’s House. The light house is cut just below its top as if to over emphasize the home. It’s actually each of these partial architectural elements – two half sheds, the light and the fence – that make the image so interesting. Today without the shed to the right and the fence, the composition seems way out of balance. It also seemed like the modern parking lot has dropped the current ground level. The white ring around the lighthouse tower is just barely visible over the roof today regardless of how far back I tried to stand whereas it is well above the roof in Hopper’s image. Last year the Bowdoin College Museum of Art staged an exhibit of many of Hopper’s Maine scenes. They’ve also put together an interesting set of comparisons of paintings and the locations today. I’m particularly impressed with how well they matched the rocks of Monhegan Island (below). Perhaps something to see on my next trip to Maine! I didn’t know about these paintings but can see similarities esp. with the lighting in Hopper’s more famous paintings. Fascinating post, Christina. Thanks! I can’t help looking at a landscape and wondering if it represents a real place or is an assemblage of sites. Can anyone tell me where the original watercolor ” Captain Strout’s House, Portland Head” is currently displayed?